Muswell Hill is a leafy, well-to-do area of North London situated, unsurprisingly, at the top of a big hill. The centre feels more like a village than anything else, with boutique shops, cafes and restaurants lining the streets. Whenever I’m in the area, I wander through the many charity shops, some with designer clothes at minimal prices (my favourite is Shelter). Additionally, there’s both an independent bookshop, Muswell Hill Bookshop, and an Oxfam Books if you feel like browsing for a new read, and endless cafes for when you need a caffeine hit. Perhaps the nicest thing about the neighbourhood, however, are the views of the city – have a look from the top of Hillfield Park, just off Muswell Hill Broadway, or wander to the nearby Alexandra Palace and admire the city below. 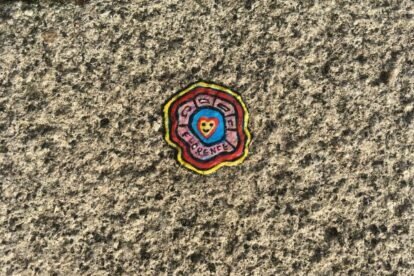 One man in the area has made it his mission to brighten the streets by painting miniature paintings on old chewing gum stuck to the floor, each inspired by something or someone different. Sometimes you can see him working away – if you start chatting he may even dedicate his next painting to you. You can find his little gems everywhere, but a good place to start is the junction of Queens Avenue and Muswell Hill Broadway. So if you’re in North London on a sunny day, why not venture up the hill to hunt for tiny works of art and admire the view.